Comments - Lago's F-16 Falcon Collection gives you the choice of several different variants including a few 2 seaters (D model) and some of the most recognisable and colourful paint schemes. 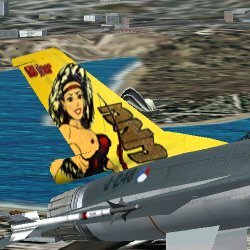 The F-16 Falcon has long been favourite of Combat Flight Sim Jocks and Jockettes. Nicknamed 'The Electric Jet' because of it's 'fly by wire' (FBW) flight control system, you might describe it as a supersonic aerobatic single seater with guns. Lago's F-16 Falcon Collection gives you the choice of several different variants including a few 2 seaters (D model) and some of the most recognisable and colourful paint schemes. 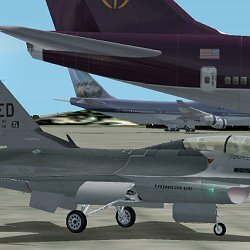 F-16 Collection for Microsoft Flight Simulator 2002 was developed by Lago and published in 2003. The cockpit is great... hey - lookout !!! 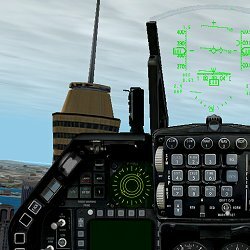 Fly the D-model and you can take a friend along. Taxying amongst the heavies puts a perspective on the size of the steed. 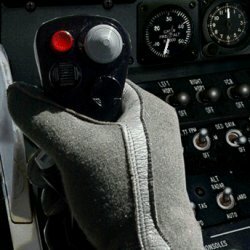 I put this in for all the Thrustmaster H.O.T.A.S. Cougar owners!